Springerville, AZ – April 16, 2019 – After receiving a report last week of a deceased horse, it was confirmed by Forest Law Enforcement to be located on forest road 51, outside of the Heber Wild Horse Territory. Law Enforcement Investigators were called to the scene, unfortunately because the Forest Service was not notified in a timely manner, the scene was contaminated and the remains were too decomposed for necropsy. The date and cause of death are unknown. There are a variety of factors that may lead to free-roaming horse deaths, which can include accidents, old age, sickness, disease, predation, and man caused (accidental and intentional). The Apache-Sitgreaves National Forests is committed to our mission to manage horses and to fully investigate their deaths when these unfortunate incidents occur. It is important to point out that only law enforcement officers and members of their team are authorized to perform investigations. If the public encounters an injured or deceased horse they are urged to contact the Black Mesa Ranger District at 928-535-7300 to report it immediately. The public should never attempt to conduct an investigation, or collect evidence, or do anything to contaminate the scene in any way. Doing so will make any evidence collected by the public inadmissible or usable in an investigation. Forest Service law enforcement, along with Navajo County and Coconino County Sheriff’s Offices continue to investigate the horse deaths from earlier this year. The public is asked to pass along all tips to the Navajo County Sheriff’s Office tip line at 1-800-78CRIME. With the arrival of spring it is time to make sure your home is Firewise! * Limit the amount of flammable vegetation or choose fire resistant plants. * Clean off roofs and vents and make sure the gutters are clear too. Don’t wait until it’s too late and fire dangers is high to take these simple preventative steps to safeguard your home! Hazards such as black ice, fog, high winds and white out conditions can impair visibility and safe driving. Safety tips include slow down, don’t tailgate, turn headlights on. 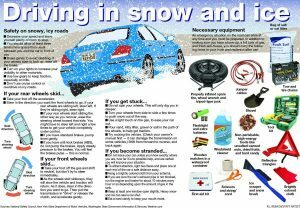 Stock an emergency kit and blankets , check tire treads and wiper blades and ensure all the lights are working. Here are other winter driving tips. Heavy rains falling on melting snowpack can produce disastrous flooding, swelling in creeks and rivers and overflow of lakes and reservoirs. With the heavy rains we have been experiencing, on top of melting snow we will continue to experience rapid runoff causing streams to rise. 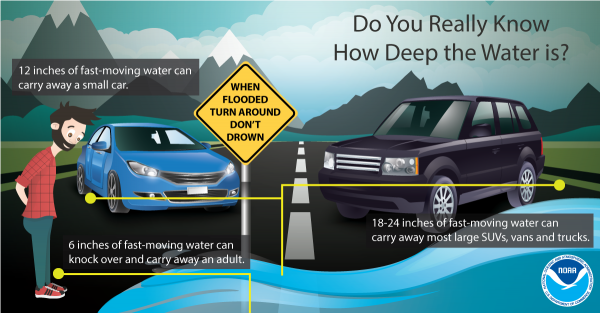 Use caution in these areas, do not drive thru the streams and rivers, Turn around, don’t drown!